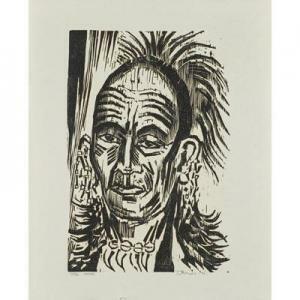 Find artworks, auction results, sale prices and pictures of Werner Drewes at auctions worldwide. 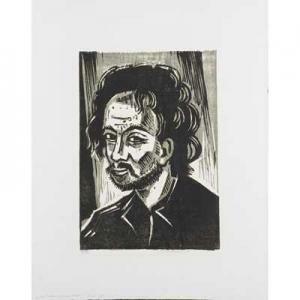 WERNER DREWES (American, 1899-1985) Five woodblocks in colors; "The Adventurer" (Rose 345), 1975, "The Sick Artist" (Rose 261), 1969, "Two Refugees" (Rose 297), Untitled (Rose 283), 1970 and Untitled (profile portrait) (one framed); Each signed and noted with edition, two dated; "The Adventurer": 24 1/4" x 19"
Drewes, Werner (German-American, 1899-1985). "Marseilles - Sunny Harbor." 1956. Woodblock print in yellow, orange, blue, gray, and green. Artist's Proof. 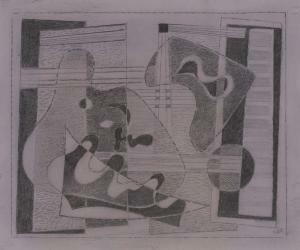 Signed in pencil, l.r., editioned and titled, l.l. Rose 174. Image: 25" x 7 1/4" Framed: 32" x 14 1/2" Condition: Under glass, not examined out of frame. 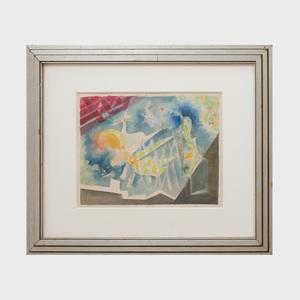 298 Werner Drewes (1899-1985): Suspicious Meeting Watercolor on paper, 1936, signed 'Drewes' and inscribed 'A67' lower left and right, titled and dated lower left (under the mat), titled and inscribed 'A67' on the reverse. 10 x 12 3/4 in. (sheet), 16 3/4 x 20 1/2 in. (frame). Provenance:The artist; Princeton Fine Art Gallery. Condition: A tackhole at the lower sheet edge. Surface soiling. A small piece of Japan at the right sheet edge. Remains of old paper tape at places around the reverse of the sheet edges.